Channel the sophistication of classical style with this handsome and timeless piece. Kiln-dried solid timber that has undertaken the appropriate treatment to deter pests and achieve timeless longevity. The timber is SVLK certified; sourced from environmentally sustainable plantations and processed in compliance with government regulations. To ensure optimum quality and longevity, wipe with a clean cloth and please avoid direct sunlight. Care Instructions: Regularly clean using dust cloth/feather duster and only use furniture polish spray when necessary (not for painted furniture). Topple Risk: Yes Care Instructions: Regularly clean using dust cloth/feather duster and only use furniture polish spray when necessary (not for painted furniture). Established in 2002 La Verde has had more than a decade of experience and knowledge in manufacturing high quality handmade timber furniture. 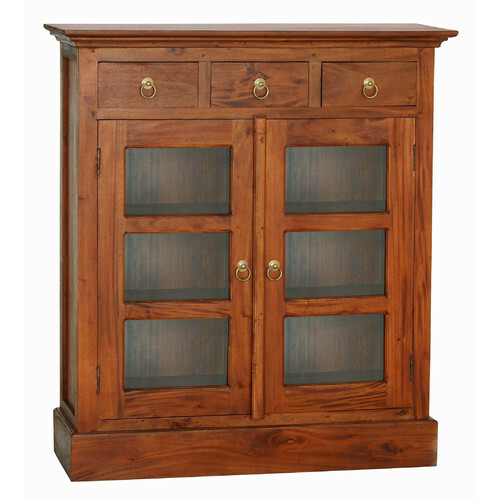 With this our company has been privileged to be a leading furniture wholesaler in Australia. The design process of our pioneering products involve both aesthetic and functional consideration in order to create stylish furniture without the need to compromise its quality, comfort and durability. Most of our furniture is made from solid Mahogany timber allowing it to be it strong and resilient whilst taking advantage of its beautiful natural grains. Our company adopts the kiln-drying procedure to achieve structural integrity and an equilibrium moisture content in each and every product. Acting in accordance with our company’s beliefs and values in regards to the sustainability and legality of our products; we are proud to announce that La Verde has obtained a Timber Legality Verification System Certificate (SVLK) issued by Indonesian Government. In order to be certified, La Verde had to undergo an extensive evaluation and auditing process to ensure that the timber products and raw materials obtained have met the legal aspects stipulated by Indonesian Government. Our customers can be confident that our products only contain timber that has been legally logged, transported, and processed. When you buy a Small Jolynn 3 Drawer Display Cabinet online from Temple & Webster in Australia, we make it as easy as possible for you to find out when your product will be delivered to your home in Melbourne, Sydney or any major city. You can check on a delivery estimate for the La Verde Part #: DC-003-PN-(LP) here. If you have any questions about your purchase or any other Display Cabinets product for sale our customer service representatives are available to help.Whether you just want to buy a Small Jolynn 3 Drawer Display Cabinet or shop for your entire home, Temple & Webster has a zillion things home.